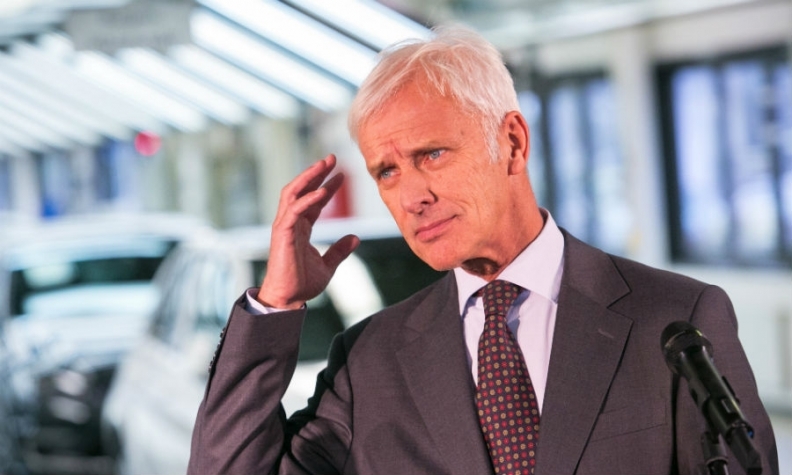 VW CEO Matthias Mueller is breaking with earnings etiquette by personally fielding questions on an analyst call. FRANKFURT (Bloomberg) -- Volkswagen Group CEO Matthias Mueller is set to unveil the company's first quarterly loss in more than 15 years. He also will face his first public grilling from investors as he tries to gain their trust during the automaker's diesel-emissions crisis. VW will probably post a 3.26 billion euro ($3.60 billion) operating loss for the third quarter on Wednesday, compared with a 3.23 billion euro profit a year ago, according to 10 analyst estimates compiled by Bloomberg. After vowing to introduce a new corporate style at Volkswagen, Mueller is breaking with earnings etiquette established by his predecessor, Martin Winterkorn. He will personally field questions on an analyst call, a task the former CEO preferred to delegate to his finance chief. Mueller has already met with workers and will brief German Chancellor Angela Merkel this week during a trip to China. The appearances are crucial as Volkswagen braces for costs that analysts have estimated could total from 20 billion euros to as much as 78 billion euros. The company has already said it needs to adjust its forecast, acknowledging that the 6.5 billion euros it set aside in the third quarter won’t cover the full cost of lawsuits, fines and repairs for 11 million affected vehicles. Such a burden could require the company to raise money from investors by selling assets or new shares. "This is an important week for VW to re-establish some of the bridges with the investment community," said Jose Asumendi, a London-based analyst with JPMorgan Chase & Co.
Volkswagen has lost some 21 billion euros in market capitalization since the scandal became public on Sept. 18. Mueller will need to address questions ranging from the progress of the investigation into how the cheating came about to longer-term strategy issues. Most pressing are the cost and timing of recalls for 8.5 million cars in Europe and 480,000 in the U.S. Though some will only need a software update, left unclear thus far is exactly how Volkswagen will fix those that do require new parts. Others may be bought back entirely. "We understand that VW is in a very tricky spot,” said Arndt Ellinghorst, a London-based analyst with Evercore ISI. “Nevertheless, the company should be far more proactive and release more factual details concerning its recalls." The new CEO has said he will build on his predecessor’s plan to decentralize operations in a bid to make Volkswagen leaner and more cost-efficient by avoiding bottlenecks at headquarters that have delayed decisions in the past. The manufacturer can recover from the scandal in two to three years if it makes the right decisions now, he told managers at a meeting in Leipzig, Germany, this month. Volkswagen’s robust balance sheet can at least partly offset some of the anticipated costs. VW had 21.5 billion euros in net liquidity at the end of June. It also has 10.9 billion euros in marketable securities, which the company could sell if needed. Its finances will be bolstered by the shares VW sold in former partner Suzuki Motor Corp. for about 3.4 billion euros. It will also eventually get a lift from the sale of its 50 percent stake in LeasePlan Corp., selling the fleet-management company it owned with Bankiers Friedrich von Metzler in a transaction valued at 3.7 billion euros. That deal hasn’t closed, so the gain will be booked later. To lower spending, Mueller has said non-essential investments will be canceled or delayed. The namesake VW passenger-car brand, which accounts for the majority of vehicles to be recalled, announced this month it will cut annual investment by about 1 billion euros and speed up its existing cost-saving efforts. The recall also affects the Audi, Skoda and Seat marques as well as VW’s light commercial vehicle unit. And then there is the immediate impact of VW’s battered reputation. That could hamper its recovery if consumers shy away or demand steeper discounts to buy VW cars. There are already signs of tougher markets for VW. The company ceded the lead in the global auto sales to Toyota Motor Corp. after gaining the No. 1 position just three months ago. "There are still a lot of question marks," said Sascha Gommel, a Frankfurt-based analyst at Commerzbank, who put his recommendation and price target for VW shares under review Monday.